In a previous post, I outlined how social attitudes determined the acceptance and shaping of instruments, particularly medical instruments. John Harrison Curtis (1778-1856) was another medical practitioner who followed the early nineteenth century trend in aural surgery to introduce new instruments and innovations for improving medical diagnosis and surgical treatment of deafness and ear diseases. No pains seem to have been taken to ascertain the real state of the organ itself; and thus, the ear being neglected, dumbness ensured to deafness,–the miserable sufferer is looked upon as one condemned, and is shut out from the sympathises of his fellow creatures. By recognizing the distinctions between the causes of deafness, Curtis claimed that proper medical and surgical remedies could be applied; while he mistakenly believed that most variations of ear diseases could be cured by using a syringe for irrigation of the ear, many of his treatments did, at the very least, provide relief if he was heralded as a successful practitioner among his society. The cephaloscope, first introduced by Curtis in his 1842 On the Cephaloscope, was designed to show whether there was a free circulation of air in the ear drum; the presence of a blockage would aid the aurist in making a diagnosis. Strictly speaking, Curtis’ cephaloscope is nothing more than a modification of a stethoscope, similar in design, though larger in size. 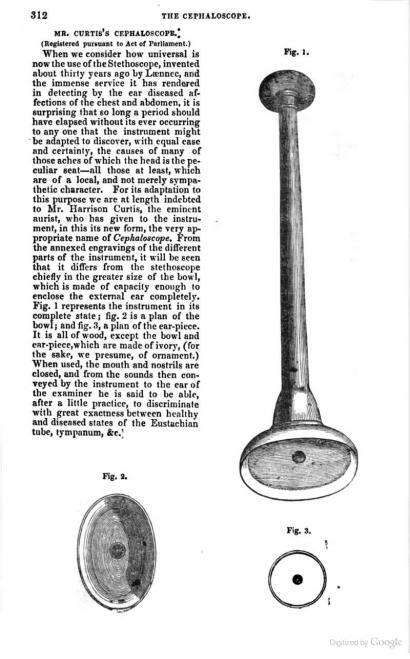 A translation of the term literally means “an instrument used in auscultation of the head.” It is a long wooden tube, with an ivory ear-piece at one end, and a large bowl at the other; the bowl differs from the stethoscope by its greater size, and is designed to completely enclose the external ear. The aurist was to apply the larger bowl over the patient’s ear, gently pressed and held firmly, and listen through the ear-piece for any abnormal sounds. Any abnormality in the ear would be heard by the practitioner using the cephaloscope by an absence of sound from the rushing of air or evidence of some blockage. While the practitioner had the cephaloscope enveloping the patient’s external ear, the patient was told to block one side of the nostril, and forcibly blow through the other. If Eustachian tube and/or tympanum were intact, there would be an obvious rushing of air. Curtis’ cephaloscope, of course, was far from the first diagnostic instrument used in aural surgery. Diagnostic instruments in aural surgery have a long, albeit sporadic history, dating to the first ear speculum in 1363. The difficulty in examining the conical cavities meant that ear speculums remained consistent in design, though in most cases they were ineffective for examining the ear. The eighteenth century introduced instruments that manipulated light sources, either from the sun or by flame. The instruments, however, were inadequate on cloudy or rainy days, and at night; those aided by a candle left it vulnerable to the flickering of the flame, which in turn, undermined the validity of images of the tympanum. As the stethoscope has been found to be useful in so many instances, it would appear to be exceedingly extraordinary should it not be of service in aural surgery, the diseases of that organ being so intimately connected with sound and the atmospheric air…Accordingly, we find recommendations respecting its use in several authors; but unfortunately the stethoscope, as at present constructed, is very unfit for such a purpose. In short, the cephaloscope was constructed to remedy the limitations of using the stethoscope in aural surgery. Nonetheless, in the entire chapter in the book reserved for the cephaloscope, Curtis spends little time actually discussing the merits of his instrument in practice, or providing extended cases studies of its application. The cephaloscope was registered and not patented, a curious fact that Curtis alluded to availability—he wanted the instrument to be accessible for other aurists and thus made it available through Mr. Edward Einsle, the surgical-instrument maker at the Royal Dispensary for Diseases of the Ear. The cephaloscope was also presented to the Royal Society of London and credited in the Philosophical Transactions. It is difficult, however, to ascertain how commercially successful Curtis’ cephaloscope was. There is little historical evidence supporting the notion that Einsle actually built the instrument, or that Curtis used it for his own practice. It is also likely that the similarity between the cephaloscope and stethoscope, and the numerous variations of the stethoscope resulted in the cephaloscope being miscategorized in history. I found one secondary source reference to the cephaloscope in Adam Politzer’s History of Otology, but Politzer describes Curtis’ instrument as an ‘otoscope’ and places the word ‘cephaloscope’ in enclosed brackets. Curtis’ lack of intense discussion on the cephaloscope or its commercialization forces us to question Curtis’ motives in constructing this instrument. It seems to me, however, that the cephaloscope is historically revealing as a representation of the material expressions between medicine, society, and technology. In the first place, the instrument demonstrates how there appears a juxtaposition between difficulties in diagnosis and the tools used for examination. Through his career, Curtis repeatedly emphasized the importance for aurists to practice proper diagnostic examinations and treatment procedures, explaining that it was necessary for distinguishing between curable and incurable deafness and improving the position of the deaf in society. In addition, wider themes of the physician’s role with the patient, the use of technological intervention in diagnosis, and the transformation of the patient’s narrative, are all represented within the cephaloscope. Secondly, as an instrument of diagnosis, the cephaloscope represents the medicalization of the deaf, one which relied on the aurist’s detached and objective expertise for diagnosis, instead of the patient’s subjective experience. While Curtis’ trumpets and chair served to provide an alternative means for restoring hearing loss, if medical and surgical procedures were ineffective, the construction of the cephaloscope reveals that an improved technology could yield improved diagnosis and treatment. The cephaloscope allowed for cases of what Curtis terms as ‘nervous deafness’—an ailment commonly residing from a blockage in the Eustachian tubes—to be diagnosed more efficiently and accurately. In doing so, the aurist was able to make a more objective diagnosis and if necessary, implement his authority and provide a medicalized definition of deafness. Thirdly, the cephaloscope represents a struggle for authority and credibility. While Curtis was commended and praised for his early work, by the late 1830s he was severely criticized for his lack of knowledge about pathological anatomy and his misunderstanding of the physiology of the ear. In particular, Curtis’ article in The Lancet in 1838, which claimed that many cases of deafness arose from a deficiency of creumen (ear wax), did much to damage his credibility. The fact that Curtis introduced the cephaloscope shortly after his disastrous article conveys the possibility that the cephaloscope was a last-ditch effort on Curtis’ part to restore his reputation. This can be supported by the notion that Curtis modelled the cephaloscope on an already popular and well-established instrument in order to win favour from his contemporaries. Why couldn’t the cephaloscope do for the ear what the stethoscope did for the heart and lungs? ** Please note that John Harrison Curtis’ biography and the state of aural surgery in nineteenth century Britain and France is an ongoing project for me. I’m still digging through archival sources, analyzing related primary texts, and reading connecting secondary sources. If you find an error with whatever I am saying, can recommend useful texts, or can direct me to appropriate archives/sources, please feel free to leave me a comment. John Harrison Curtis, Treatise on the Physiology and Diseases of the Ear, 6th Ed. (London: Sherwood, Neely & Jones, 1836), p.161. John Harrison Curtis, On the Cephaloscope and its uses in the discrimination of the normal and abnormal sounds in the organ of hearing with remarks on the diseases in which it is applicable (London: John Churchill, Princes Street, Soho, 1842), p.77. Curtis, On the Cephaloscope, p.66.